PD’s Postulations: Cheating Doesn’t Pay…Right? There has been a lot of cheating lately. A lot of cheating in action, a lot of talk about cheating, a lot of speculation about what will be done about it and who will suffer. We still wait for the other shoe to drop on Miami while the first shoe has just dropped on Oregon, and there is no telling whether the shoe will ever be tried on at Auburn. And thanks to the nonsensical ramblings of a jailbird, some tried to wedge the shoe onto Will Muschamp’s foot, but glass house’s slipper would not fit on Cinder-fellah. When the 2010-11 BCS title game between the Ducks and Tigers concluded, I suggested that this will soon be known as the championship game that never happened, as both will be forced to vacate their seasons when the NCAA gets around to it. They are still taking their time, but the wheels on the NCAA paddy wagon are finally moving. And the flouting of the rules is certainly not restricted to college football. Tiger Woods – famous for shattering the PGA record for infidelity – has upped his game from cheating on his wife to cheating at the Masters. But just as when he cheated on his wife, he claimed not to really know what he was doing – and was soon forgiven by the fans and media. He gets more distance from that excuse than he gets from his Titleist. While there are many examples of how crime does pay – from the trophy rooms of Lance Armstrong to the most recent national title banner hanging in Rupp Arena – it is not the question of whether cheating pays off that concerns Gator Nation. It is whether a major sports program can succeed at the highest level without cheating, while seated in the deepest prisoner’s dilemma this side of “Law & Order: Criminal Intent.” It has been a few years now since Urban Meyer made his famous statements about all the “garbage” in college football that was a contributing factor to his resignation. 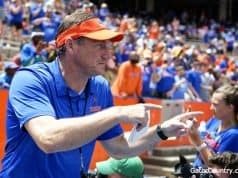 Though he no longer remains the Gator coach, one thing in this heap of garbage that does remain very relevant to the Gator program is widespread cheating across the SEC and among the nation’s other elite programs (though it is a stretch at this point to believe that any non-SEC programs can be considered national elite). Meyer has been even more direct about the preponderance of cheating schools than Coach Muschamp has been about the, shall we say, “ADVERSITY ON THE FIELD” with which he has had to deal since taking over the Gator helm. 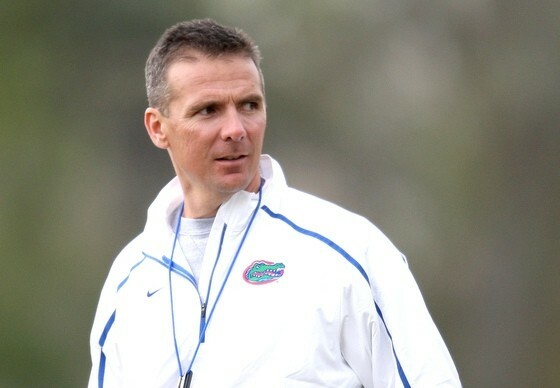 Urban also attacked the complete lack of compunction or fear of NCAA reprisals among the offending staffs. So should we expect to start hearing the same things from Muschamp? Should we adjust our expectations in exchange for a clean program? As for the latter, it has not stopped him from succeeding quickly at a very high level on the field and the recruiting trail, it didn’t keep Meyer from winning two national titles in three years, nor did it prevent Steve Spurrier from winning six SEC titles in seven years. But is it still realistic to believe that an ethical coach can run this gauntlet of SEC riffraff year after year without suffering from the burnout that burdened Spurrier in the second half of his Florida tenure and knocked Meyer clean out of the box? First of all, let me say that I believe it is possible to win big in the SEC – at Florida – with a clean program, even with half the league and all the other state schools cheating. I think this primarily because as I mentioned before, UF has been doing so for over 20 years. Spurrier complained openly about the snakes against whom he had to compete while Florida’s coach, both indirectly and directly, and even turned in a couple of teams to the NCAA for cheating (and has done so to at least one team while at South Carolina). Who could forget his questioning aloud on national signing day 1993 of how exactly FSU is able to sign All Americans at every position every year even though they have a roster stacked with them already? His accusatory complaints were later proven to be very accurate, yet he still was able to recruit well and win at a Hall of Fame level. Speaking retrospectively, Meyer’s accusations have already been proven accurate as well. In total between the Spurrier and Meyer coaching regimes, 9 of the 11 other SEC programs – as well as FSU and Miami – have all been caught cheating and/or put on NCAA probation for cheating. Auburn, Alabama, Ole Miss, UT, Miami and FSU were all put on probation during Spurrier’s tenure, with Kentucky getting 3 years for violations committed during his regime; Arkansas, MSU, South Carolina, Alabama (again) and FSU (again) were all put on probation during Meyer’s tenure. FSU and Alabama just came off of probation (not that you would have known it from their recruiting numbers), as did LSU, and Tennessee and South Carolina as well as minor state player UCF, who is currently on probation. Meanwhile, MSU and Auburn both have been under the microscope for the past few seasons for the recruitment of Cam Newton. The only two teams in the SEC, or state of Florida’s other ‘Big 2’, that were not caught cheating on Spurrier’s or Meyer’s watch were Georgia (last busted in ’85-’86) and Vanderbilt. It bears noting that UGA coach Mark Richt was illegally distributing money for a number of years – over $60,000 total in cash gifts – to his staff in clear and deliberate violation of NCAA rules, but these were deemed to by secondary violations by the NCAA. Now those are just the incidents where the NCAA – the Buford T Justice of collegiate law enforcement – has bothered to detect and pursue. Meyer contends that the cheating is far more rampant. Could it be? Using this past few recruiting seasons as a guide, there certainly are strange things afoot. The big jump by Auburn after their national title can easily be explained by their run to the national title, although there is enough smoke on the plains to bankrupt any fire department regardless of reasonable cause. There’s plenty of smoke cross-state as well, but of course they are Alabama, and having won three national titles in the last four years, they should be cleaning up in recruiting. However, with four major probations in the last 16 years, including the 3-year sentence that just concluded in 2011, cheating seems to be their long suit and they have earned no benefit of the doubt here. Then you have the case of Clemson, a team and two head coaches that have done absolutely nothing on the field for years to warrant any recruiting buzz, and in fact have a very dubious track record of squandering what talent they have brought in. Yet for the past several years, Clemson has been pulling Top 10 classes out of the proverbial hat. Likewise, Jimbo Fisher has been the de facto head coach at FSU for six years of embarrassing ACC mediocrity, yet there they were hauling in Top 10 classes the last few years, including a Number 2 class in 2011 that included a few “lifelong Gator fans” who for some reason, would not give Florida the time of day. And as for the teams who have been logging Top 10 classes regularly for years to match Top 10 programs on the field, the recruiting hauls are not out of step. Still, those steps may have been paved the whole time with a little extra blacktop. My prediction? Like Spurrier before him, Meyer’s accusations will be (further) validated: expect even more, up to a handful of programs in the SEC and state of Florida to be found guilty of major recruiting violations over the next 5-6 years. Odds are at least one of them makes its home in the state of Alabama. But history has shown that cheating is usually worth the risk, and even worth the punishment when caught. 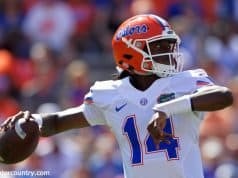 In college sports, the old adage is turned on its ear: “Cheaters usually win and winners usually cheat.” In my next column I will delve a little deeper into the consequences of cheating (or lack thereof) and how Florida can expect to fare going forward while playing it clean. Until then, remember that every day is a gift, that’s why they call it the present.